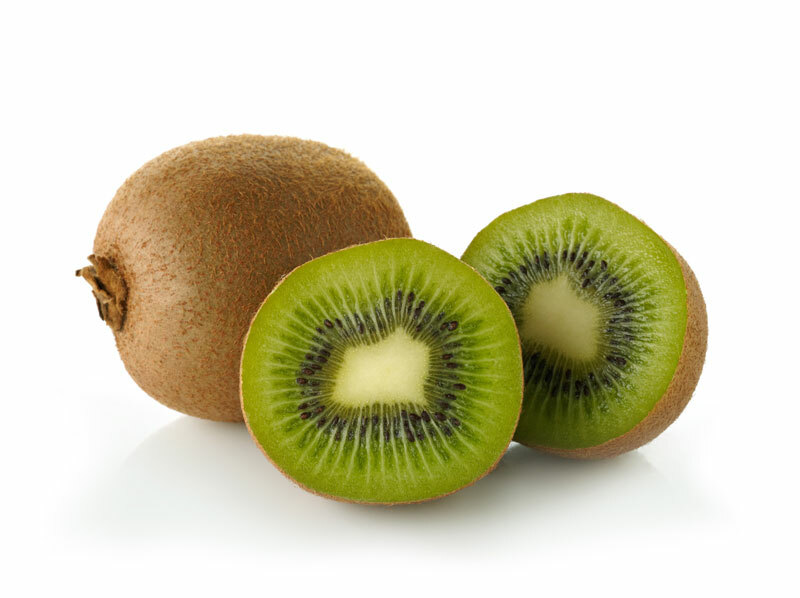 Kiwis, or kiwifruits, are known for their striking green insides, edible black seeds, and fuzzy skin. The flavour of these egg-shaped fruits is sometimes described as a cross between a peach and a pineapple, with the texture of a strawberry. But did you know that kiwi is technically a berry? Native to China, where kiwis are known as Chinese gooseberries, these green gems were brought to New Zealand, where many are grown today. There, they were re-named after New Zealand’s national bird because of their resemblance to the brown and hairy kiwi bird. Kiwis are often enjoyed on their own because of their beautiful colour and delicious taste. However, their tart-sweetness lends great flavour to desserts and smoothies! 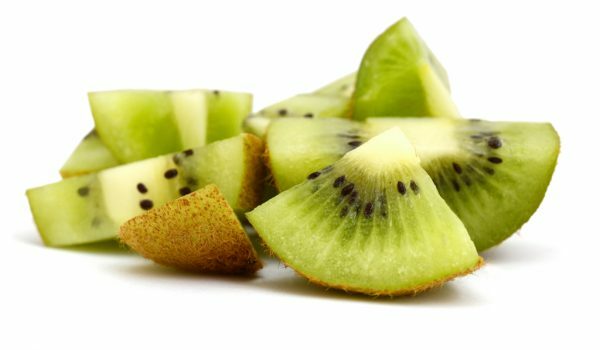 Typically, you’ll only find green-fleshed kiwis at the supermarket, but sometimes you may also see a smooth bronze-skinned, golden-fleshed kiwi, or even little kiwi berries, also known as hardy kiwi. ZESPRI® SunGold yellow kiwifruit is sweeter than green kiwifruit. While it’s still tangy and sweet, it tastes like a cross between a mango and strawberry. They’re slightly larger than green kiwifruit, and they have a smooth, hairless skin with juicy yellow flesh. 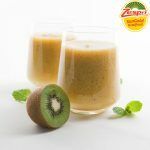 For even more info about different varieties, click here to visit zesprikiwi.com. Kiwis taste great no matter what size they are, but look for fruit that is unblemished and firm. Avoid shrivelled, mushy, or wet kiwis, as well as fruit with overly soft spots. Much like when checking the ripeness of an avocado, ripe kiwis give slightly to pressure. With your thumb, gently squeeze to see if the skin yields to pressure. Take care to avoid applying too much pressure though, as this will bruise the fruit. Un-ripened kiwis will be hard to the touch and can be stored in the fridge for up to 4 weeks. Since kiwis will continue to ripen after being picked, to ripen a kiwi, store it at room temperature until it begins to soften. Once a kiwi is ripe, it can be enjoyed right away or stored in the fridge for several days. If you want to speed up the ripening process, stick a kiwi in a brown paper bag or perforated plastic bag with a banana or apple for a day or two. The natural ethylene gas from the banana or apple will help the kiwi ripen faster. Kiwis are great to freeze! They hold their shape, texture, and colour quite well even after freezing. However, since they are high in acid, adding sugar or sweetening with a simple syrup will help improve their flavour and hold their shape. Prepare with sugar: Add cut kiwi to a bowl. Mix (up to) ¼ cup white sugar per 1 cup of cut kiwi, then flash freeze on lined baking sheet. Prepare with simple syrup: Prepare a simple syrup by boiling, then cooling 3 parts sugar to 4 parts water. Cover diced kiwifruit with syrup and freeze in ice cube tray. Once frozen, transfer to an airtight container or freezer bag and store in freezer. Consume frozen fruit within 10 months! Before eating, you’ll want to give kiwis a gentle rinse under cold water – but be careful not to bruise them. They can be eaten like an apple, skin and all, or you can peel off the skin. There are two easy ways to remove the skin. Either cut the kiwi in half and use a spoon just under the peel to scoop out the flesh, or peel it with a paring knife in one big swirl like an apple. Kiwis won’t oxidize and brown, so you can cut them in advance and pack them for lunch the night before or for a quick snack later. You can also cut kiwi into sliced coins, dice them for a salad or cut them into quarters to eat later! One large kiwi will give you 1/3 to 1/2 cup of sliced fruit. To avoid bruising, try not to layer kiwis on top of each other, especially if they’re ripe. Some use the bottom half of an egg carton to store ripening kiwifruit. 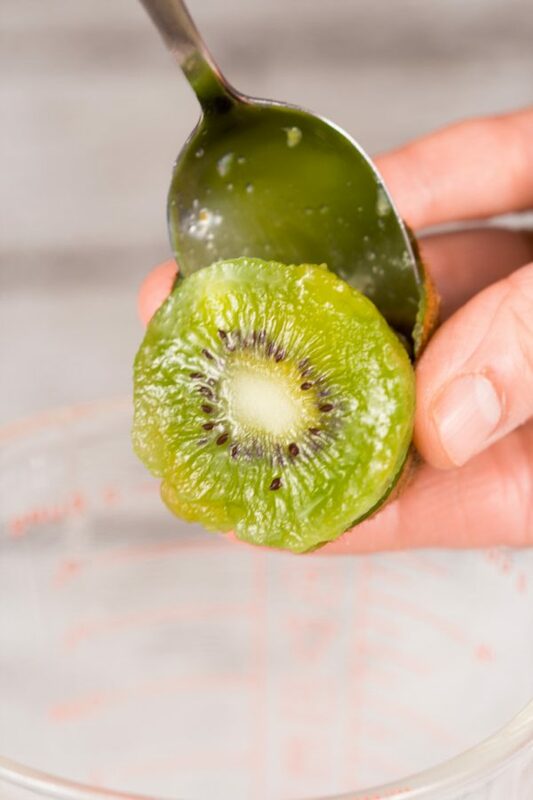 To get perfect slices, peel a kiwi and use an egg slicer to cut it! Place kiwis in a paper bag with a banana or apple to accelerate the ripening process. 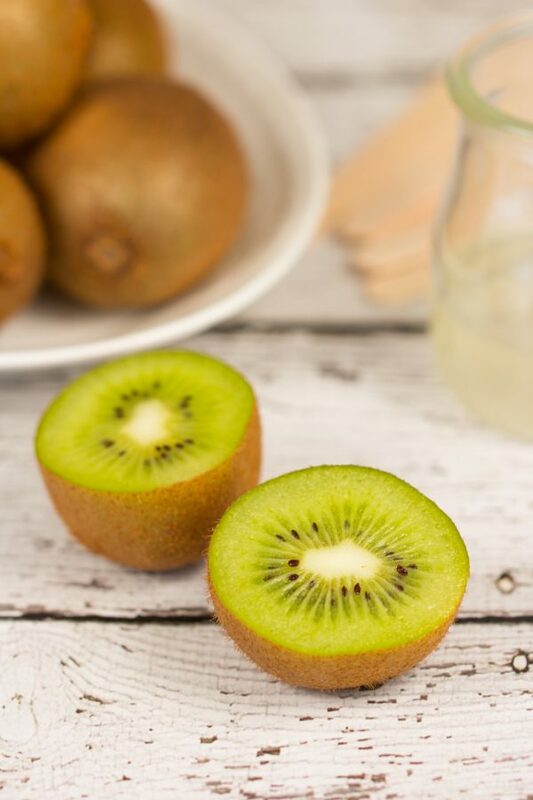 Kiwi’s sweet-tart flavour is perfect for disguising the flavour of greens like kale and spinach in your smoothies! 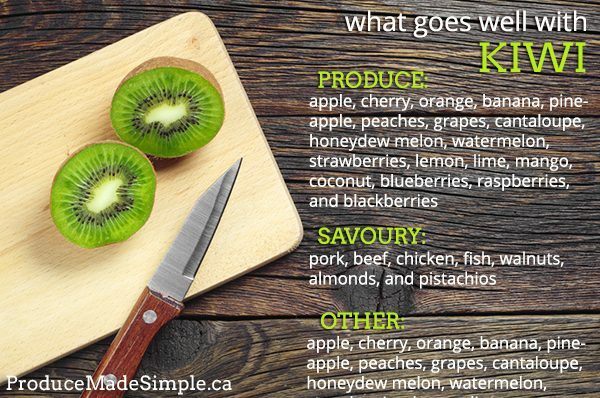 Note that kiwi can actually tenderize meat, so it is a a perfect ingredient for a marinade! Kiwis are delicious on their own, but they are also versatile! For a traditional sweet dish, layer kiwi slices over a chewy meringue nest, or as a filling between cake layers. For a lighter treat, try making kiwi popsicles! Add fresh cut fruit like kiwi and freeze it with yogurt, coconut water, or your favourite fruit juices. 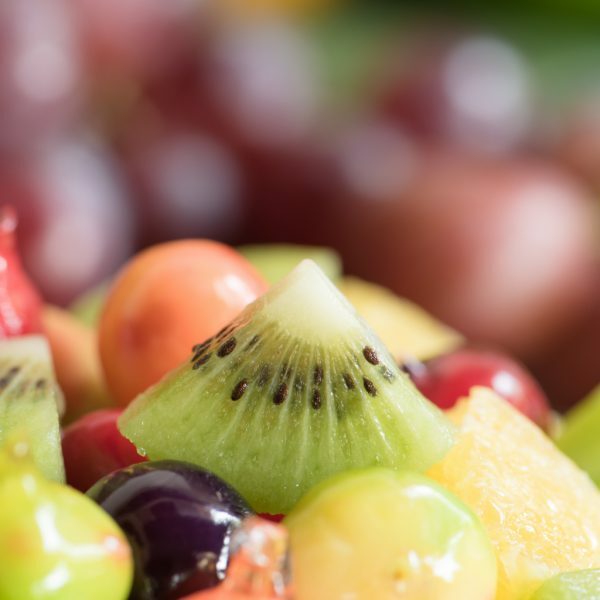 Kiwis add flavour and a beautiful green colour to fruit salads, like this Kiwi Berry Salad. Try cutting your kiwi into pretty designs to add a fun element to your bowl! For any recipe with strawberry, try swapping kiwis instead! They are similar in texture and flavour and will add a familiar – yet new experience to family favourites like strawberry shortcake, chocolate covered strawberries, or meringue nests. Kiwis can tenderize meat, so fresh or frozen and thawed kiwifruit is a perfect choice for marinades, salsa or sauces that pair perfectly with meat. Try making this Golden Kiwi Ginger Sauce to serve with grilled chicken! Aside from using them in marinades and sauces, kiwis are not recommended for cooking in savoury applications. 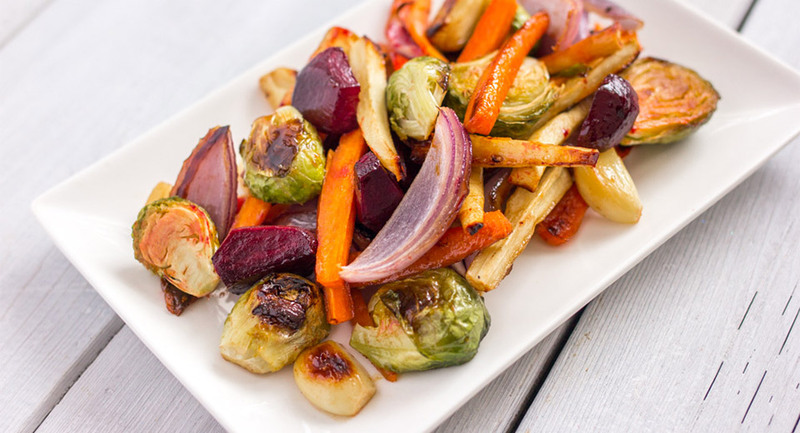 Want more serving ideas? 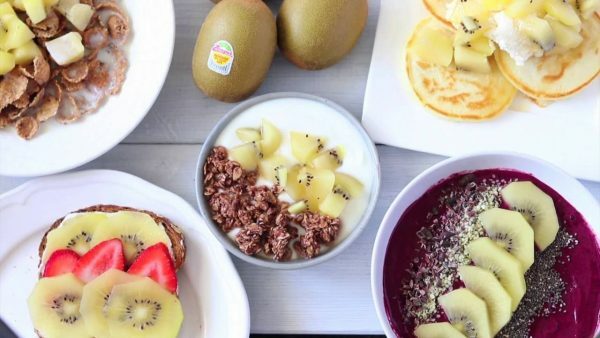 Check out this roundup of 10 ways to use ZESPRI® SunGold kiwis! According to the Canadian Nutrient File, 1 medium kiwi (approximately 75 g) contains a great number of your daily-recommended intake of nutrients: 150% of Vitamin C, 50% of Vitamin K, 12% of fibre (3 g), 11% of folate, 9% of potassium, 7% of magnesium, 5% of Vitamin A, 3% of calcium, 3% of Vitamin B6, 2% of iron, and 122 µm of the antioxidant lutein and zeaxanthin. What a powerhouse in such a small package!